AEViewer is an After Effects extension that basically serves as a media manager and project packager toolkit for artists. This review article will be based on the new v1.5 that was recently released (and no, this wasn’t sponsored). We’re also giving away 10 free copies to random people who subscribe to our YouTube channel and comment on the video. Browsing your system directories and getting full thumbnail, video playback, or waveform feedback makes it much faster than using the import dialog from After Effects that uses Explorer/Finder. The ability to adjust the size of thumbnails was handy, and favoriting files made it easy to find common files. The tool can also create .gif previews of project files, which work within the tool so you can preview .aep files quickly. This does require some pre-planning though so I would only do it if I really needed it. Generally, things work as expected without any issues. Previewing files is the core AEViewer. 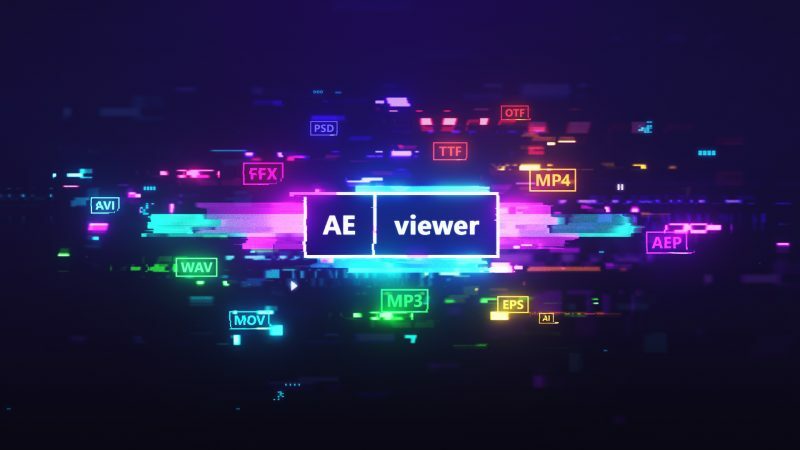 Starting with v1.5, AEViewer has added features to help artists package and distribute their After Effects projects, and add compatibility with AEViewer. Basically, AEViewer can save compositions as their own project file (.aep) so you can split projects up by composition. It can also save your project file, along with all asset files used in the project, and package them into a .zip file with some metadata you provide. This .zip file plays nicely with AEViewer, as you can import them quickly and get some basic information (author, version, website) about the project as well as a preview image (supplied by the project author). Basically, AEViewer is trying to encourage template authors or people building branding packages to incorporate them with AEViewer, making it easier for the end-user to manage and use the templates. There are some quirks in the user experience that made using the tool a little weird. “Favorites” aren’t starred items, they’re basically directory bookmarks. Certain prompts aren’t as obvious. Setting up packaged projects require a lot of meta fields and require the thumbnail to be named a certain way. No major issues, and things they can fix in future updates. AEViewer is great, it works well previewing various files without issues. It has small handy features like favoriting items and directories, and can serve as a dumping ground for showcasing files and moodboards. If you manage a lot of assets, design or re-use templates and graphic elements, or simply just want to improve your file navigation life, then AEViewer is for you.